Come Inside is only a slender novel of 170 pages but I lingered over it because it’s so intriguing. I now know why it’s been shortlisted for The Age Book of the Year and for the Commonwealth Writers’ Prize for Best First Book. It has a compelling beginning. The story of a woman who survives an 1887 shipwreck with no memory of anything except her name begins with a series of reports that gradually reveal themselves to be the contents of a contemporary maritime museum: a newspaper report, records of interviews, customs reports, museum exhibit cards and so on. It may sound like a muddle, but it builds a coherent picture that catapults the reader back into the past while at the same time depicting how the characters looked back on the event 60 years later. Osborne doesn’t spare us the gruesome imagery: the 90 bodies from the wreck pile up on the beach ‘so that as new arrivals crashed onto old and gave the appearance of jostling for a place on the sand’. (p2) I don’t think Colego is a real place, but this story reminds me in some ways of the Loch Ard Gorge shipwreck in 1878, a tragedy which haunts anyone who visits the site down near Port Campbell on Victoria’s Shipwreck Coast. In Osborne’s story there is but one survivor, a young woman who remembers only her name, Mary Holland. She was rescued by a young man called Arthur Harris, about whose integrity there is some doubt though he is hailed as a hero in the community and is of a ‘most prepossessing appearance’ (p66). 185 of the 193 men, women and children who were lost on the Lucy were interred in two hastily-dug mass graves, an indignity necessitated by the hot weather and the decomposition of the bodies. None was identified; the remaining few unaccounted for were presumably taken by sharks or otherwise lost in the sea. How brave our forebears were to venture across the perilous oceans! BEWARE: SPOILERS (not of the plot, but of the construction of the novel). The construction of the novel lends itself well to the sense of mystery. It begins with an excerpt from the ‘1987 anniversary edition’ of ‘The Water’s Edge’ by an ‘Isobel Smith’ published in the town of Weal near Colego; there are more fragments from this centenary edition throughout the narrative. It appears to be a dramatic account of the wreck and its aftermath, written by a contemporary with a somewhat romantic perspective. Then, interspersed among the impersonal reports, interviews and museum labels – all of which show their provenance (source and date, and usually their authors too) – there are two narratives whose provenance and connection with the museum catalogue the reader must try to unravel. There is Caro’s manuscript (labelled MS 125) written in first person and set in contemporary times; and the other is an omniscient narrator who forces the reader down into the ‘cold heart-stopping sea’ with a girl. (The book’s cover photo from a piece of performance art could not be more perfect!) In this latter narrative the girl seems to be held captive by her rescuer aboard a very curious ship. Is this girl Mary Holland, the young woman who claims to be the sole survivor of the Lucy? These fragments are not consistent with Arthur Harris’s account of the rescue to ‘The Weal Clarion’. It’s all most intriguing, and I found myself reading backwards and forwards putting the pieces of the mystery together like a captivating puzzle. Caro’s story tells of a troubling relationship with her friend Jessamine and Jess’s menacing brother Daniel, and of the tragedy fragmenting her own family involving her step-sister Susannah. There is something odd about Susannah, and her step-mother Claire and her father fight about her more in her absence than they did before. It is Caro who works in the maritime museum with the secretive Miss O’Donnell, cataloguing the clandestine donations that reveal the hidden history of the town. From these museum artefacts we learn Miss Holland’s story from the letters of Eliza Campbell to her friend Mabel Phillips. The Campbells have taken Miss Holland in, and Eliza becomes a bit miffed that her sister Lavi (Lavinia) might be privy to the secrets of their enigmatic guest. Their mother is away (visiting a grandchild) and Father is busy dealing with the salvage of the wreck. Eliza is a minx looking for mischief; she would love to gossip and is greatly frustrated by Miss Holland’s reserve. She is also not happy that a suitor, Mr Simpson, has transferred his interest to the romantic-seeming survivor! It’s a delicious moment when the reader discovers the truth; from then on the interest lies in how the truth is revealed to the characters and how it affects them. This is a wonderful story written with great skill. I can’t wait to see what Osborne writes next! There’s a review at ProcrastinEight which focuses more on the enigmatic aspects of the novel (but no spoilers). PS Osborne won second prize in The Age Short Story competition and you can read her winning story A House Was built Around You While You Slept online. What an interesting and thoughtful review. I am hungry to read this book now and I am a great fan of a slight/slender work, as long as it has something nice and meaty between its pages. 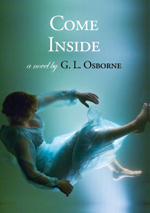 I will revisit this post once I’ve read ‘Come Inside’ and post my thoughts. Hi Karen, I hope this book does well for Osborne – I want her to write another one! Enjoyed your review and any novel that is slender with substance will be one to watch out for. Is this a new publisher? Hi Jenny, can I send this one up to you? I’d love to know what you think of it. By the look of the website they are a small outfit, but they got a copy to me in 3 days when I ordered it online. This book sounds intriguing Lisa, thanks for your wonderful review. I’d not heard of it before. I do love compact little gems much more than sprawling masterpieces. And I usually love books that use different sources and points of view to tell a story. I’ll definitely keep an eye out for it, but given the somewhat obscure publisher I may not stumble over it. You never know I guess. Hopefully those two nominations will see it gain a wide audience. That would be lovely Lisa! I see you have posted your review over at LibraryThing which will help with getting the novel known which it no doubt deserves. On its way to you tomorrow, Jenny! I read this book and thought it was beautifully written, excellent mood, etc. But I have no idea what happened. I really need to know what happened! I think I know what happened to the man who rescued the survivor, but anything else – no. Brevity, and making the reader work for their enjoyment is okay by me – but I think I understand why this book was only shortlisted and not a winner! Found this very hard to enjoy. it jumped all over the place ti much and the modern day sections were dull and served no purpise. in the end im not even sure what happened to harris and holland. i can see a lit of people not liking this book. Oh, I’m sorry you didn’t like it Warwick, I thought it was a very good debut novel. I agree that there were ambiguities but they were intended and suited the novel, I thought. Ah well, too each his own, eh?